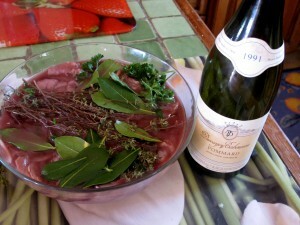 A Daube is a slow-cooked red meat stew which calls for marinating the meat, usually beef, for eight hours. Cooked in a “daubière,” this typical Provencal dish is served with pasta and grated cheese along with a sauce made from the juice which may be tossed with the pasta or served as a condiment. For the dish pictured, the meat was marinated in a 1991 Pommard, Côtes du Beaune (well past its prime, 91 not a good vintage in Burgundy). Served with home-made pasta, with a bit of truffle oil added to the water, from Fattoria La Vialla in Tuscany. 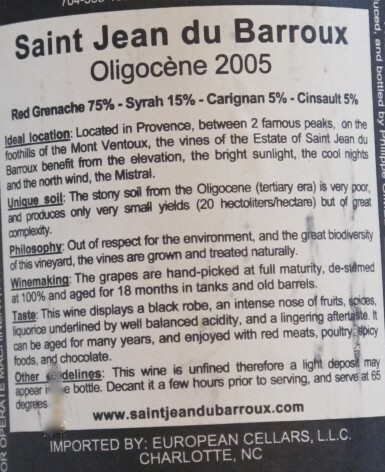 In the glass the 2005 Oligocene has an intense dark cherry color with a spicy nose of garrigue and wild flowers. On the palate, crushed fruits — blackberries, cherries and raspberries intermingle — a nuanced spicy finish; well-balanced — leaning toward medium-bodied when compared to other full-bodied vintages in the region — “elegance” being the trademark style of Philippe Gimel. The 2005 Oligocene is a blend of 75% Grenache, 15% Syrah, 5% Carignan and 5% Cinsault, which is, as of 2006, branded L’Argile. 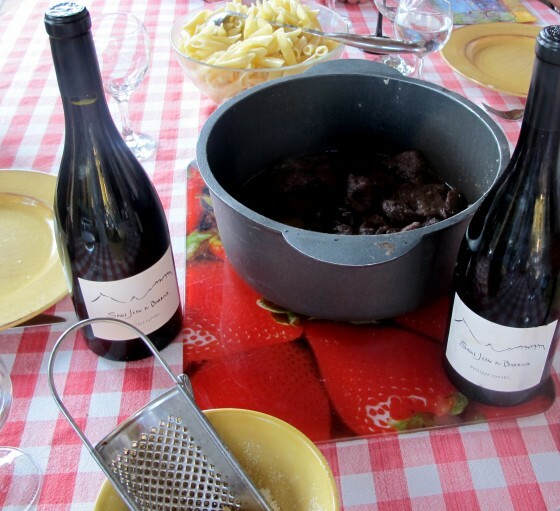 A small production cuvée — Le Pierre Noire — was introduced in 2006 which distinguishes itself from L’Oligocène / L’Argile in that it is a blend of 85% Grenache and 15% Syrah. With no more than 300 cases of Le Pierre Noire expected to make their way to wine shops’ shelves in the states — the price at Zachy’s is listed at $48 and at 30 pounds in London — it would be wise to snap up any of Philippe’s Oligocene 2005 now — it’s a takes-your-breath-away price / quality value.